S. Bottari, 'La nature morte italienne', L'Oeil, September 1964, no. 117, p. 7, illustrated. R. Roli, 'Arcangel Resani', in the exhibition catalogue, La Natura Morta Italiana, Milan, 1964, pp. 119-120, no. 285, fig. 129a. M. Rosci, 'La natura morta', Storia dell'Arte Italiana, Turin, 1982, XI, fig. 173. L. Salerno, La natura morta italiana 1560-1805, Rome, 1984, pp. 360-361, fig. 109.2. A. Colombi Ferretti, 'Arcangel Resani', La Natura Morta in Italia, Milan, 1989, I, p. 490, no. 583, illustrated. A. Cecchi, in the exhibition catalogue, Autoritratti dagli Uffizi da Andrea del Sarto a Chagall, Florence, 1990, np, no. 24. F. Baldassari, in La natura morta in Emilia e in Romagna. Pittori, centri di produzione e collezionismo fra XVII e XVIII secolo (ed. D. Benati and L. Peruzzi), Milan, 2000, pp. 272-274, fig. 295. N. Roio, in the exhibition catalogue, L'Anima e le Cose: La natura morta nell'Italia pontificia nel XVII e XVIII secolo, Fano, 2001, p. 139. Naples, Zurich and Rotterdam, La Natura Morta Italiana, October 1964-March 1965, pp. 119-120, no. 285, fig. 129a. Arcangelo Resani first trained under the painter Abruzzese Giovanni Battista Buoncuore in his native Rome. At the age of nineteen he traveled to Bologna and Forli before settling in Ravenna. His work reveals a highly cultivated figural style, linked to the Roman tradition of the Bamboccianti, to elements of the Lombard pictorial style (in particular the work of Giacomo Ceruti and Antonio Amorosi) and to the Bolognese master Giuseppe Maria Crespi. Resani is best known as a painter of still-lifes and Arcadian genre scenes, which may be characterized by a strong element of realism. 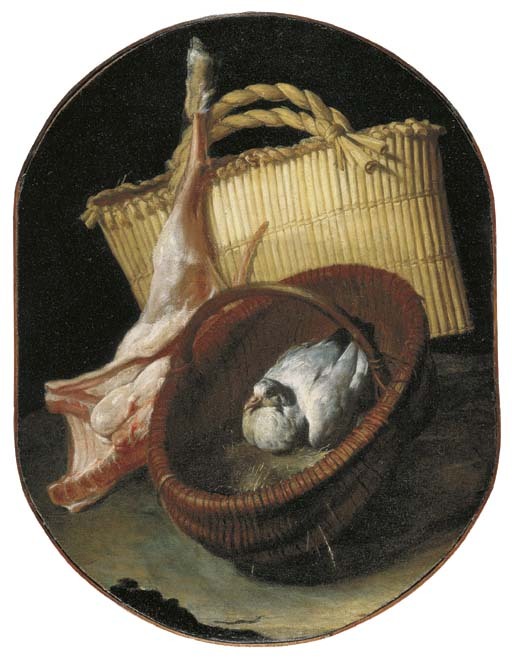 The present still life is a good example of this interest: with thick and rapid brushstrokes, the artist is able to depict the smallest details and subtle changes in tone, seen here in the treatment of the bird's plumage and the fall of light on the baskets. A key element in recognizing works by the artist is the woven straw basket, presented here as an object of craftsmanship. An eighteenth-century insciption in ink on the stretcher records that the present painting was the last work by the artist who, according to the author of the inscription, died on 6 July 1740 (or 1742), a few days after having finished this painting.